Following frosting in southeastern Australia, a significant number of growers have cut cereal and canola crops for hay. As well, some cereal crops were pre-planned as hay crops (eg oats). Typical yields of these stressed cereal or canola crops would be 1.0 to 3.0 t/ha of hay. A rule of thumb for cereal hay is that with a good plant density (~200 plants/m2), each foot of growth above the cutting height will be 2.5 t/ha (1 t per acre). Again, as a rule of thumb, the grain yield for a wheat crop is carrying 2.5 t/ha of biomass at flowering, would probably yield in grain about 40% of this amount – in this case about 1.0 t/ha of grain. The actual range is highly dependant on the amount of water – stored and as rainfall – available to the crop to finish. Canola has a similar range, with 2.5 t/ha at the end of flowering gives a canola yield of around 0.8 t/ha but it is more likely to be affected by water shortages and high temperatures than wheat. Table 1 shows the approximate nutrient concentrations for the macro nutrients N, P, K and S for cereals and canola, either as hay or as grain plus stubble. These values have been taken from a number of sources, including my own experiments in the Wimmera and Mallee during the period 1990 to 2003 with wheat and canola. Nitrogen is quite variable, as are P, S and K levels depending on soil nutrient status. Published values for K in grain are somewhat lower than the values we measured for hay and grain, and we also saw lower K values where soils were sodic and/or saline. It is well documented that Na and K compete for transport and so often low tissue K levels are the result of high sodium levels in the root zone. Table 1. Nutrients present in wheat and canola – for grain, straw or hay. Hay figures are when cut at soft dough (wheat) or early flowering (canola). * Mallee figures 19-25 kg/t, other data suggests 12 kg/t. •	Canola – 0.6 t/ha Grain = 18 kg N, 3 kg P, 3 kg S, 6 kg K 2.5 t/ha Hay = 65 kg N, 8 kg P, 15 kg S, 85 kg K.
So the clear differences between hay and grain for both crops is that hay will remove 2 to 3 times more N, and up to ten times more K than if the crop was left for grain, and maybe 5 times more S. The straw contents for both crops are quite depleted in nutrients and are a minor source of most, except K, which can be rapidly leached from the stubble. There are no data on S contents of canola hay for Australia, although the Canadians do caution about feeding it due to its high S content. Potassium is an important element in plant nutrition with most present in the stems and leaves as ionic K, which assists with water relations and transport and on some soils, this depletion will be important. a history of hay cutting (K removal). 1. Zero-till, stubble retained gives stratified K with depleted K in the subsoil by uptake and transfer. Shows up especially in pulses such as chickpea. 2. On light sands in WA, see significant header tracks with improved K status as stubble concentrates the nutrient in those rows and leads to depletion in between tracks. Recommend about 30 kg K/ha. Also reports of K deficiency linked to Powdery Mildew in barley. 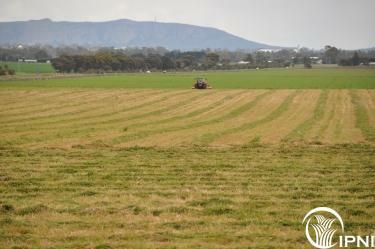 Diagnose the problem with a soil test to identify the areas or paddocks at risk. On leached sands that have had hay cut for a couple of seasons, a response is likely. If concerned apply a bag of muriate of potash presowing and monitor. Potential for salt damage if applied with the seed. Sulfur Is a potential concern for paddocks where canola hay is cut, because of the high removal reported, and the likely low input with current fertilizers. Also on sandy soils, S can get out of phase with N when applied as gypsum, and so lead to issues particularly for canola. If canola hay has been removed, some S supplementation of the following crop be considered, such as using S fortified fertilizers or gypsum applications. S can be lost if stubble is burned. Despite the large imbalances between hay and grain removal of N, especially for canola hay, I am less concerned with this nutrient. A 2.5 t/ha grain crop would take off as much N as the 2.5 t/ha grain crop, and most growers would budget to this much N anyway. N is very mobile in the plant and move N from the crop to grain and peak N is often at anthesis. It is possible that some N is lost in during grain filling although we have no Australian data on this. There is little data that can be used to make a comparison between N lost from a frosted standing crop compared to a frosted crop cut for hay, and there are different thoughts about what could happen - experience with standing dry pastures suggests that the standing crop will loose N due to leaching from the crop, and maybe the losses would be more if cut and left in the paddock. Soil C changes occur very slowly and the removal of one years biomass as a hay crop will have an effect on C dynamics, but it would almost be impossible to measure. Labile C will rapidly change and this is where N is stored and then returned through mineralisation. The rapid turnover is favoured by both the amount of material and also the amount of N in the material (C:N ratio). Provided root residues are maintained (no-till) the small quantity of high quality OM input from the hay reserves could be essentially the same as the larger quantity of lower quality OM from the crop stubble. a)	Lower soil cover means the paddock is more susceptible to wind and/or water erosion. b)	The low soil cover will also mean that lighter rains will be less successfully stored in the soil profile as the bare soil leads to higher soil evaporation. Care should be taken with stocking rates and timings, as well as traffic over these paddocks, as soil damage can make soil losses worse. There may be issues with K nutrition on light sands where cereal or canola crops have been cut for hay rather than left for grain. Sulphur depletion can also be an issue where canola is cut for hay. Growers could consider test strips with muriate of potash for K, and maybe the use of a S fortified N and P source for 2015. Soil protection is important following hay cutting, and care with grazing and traffic across these paddocks to reduce the hazard of wind erosion. It would seem unlikely that disease status would differ, although weeds should be less important following hay cutting. Brennan and Bell 2013. Soil-potassium-crop response calibrations relationships and criteria for field crops grown in Australia.